People who’ve worked with me over the years probably know how much I value a bit of collaboration. There is so much to be gained from teaming up in any way possible, big or small, with like-minded folk who share your ambitions. And especially those working in different areas with different skills who make you look at things a little, well, differently. Local honey from Leicestershire/ Derbyshire border country. 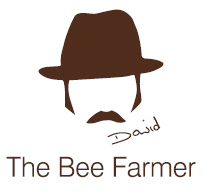 So I’m delighted to have met with The Bee Farmer, David McDowell, based up on the Leicestershire/Derbyshire border country around Ashby de la Zouch. I’d noticed David’s honey being promoted in the absolutely irresistible Gelato Village in Leicester. They use it in some of their luscious Italian ice creams. Checked out David’s website, noted his list of retail and business partners, bought a jar of honey and then tweeted him. We met over refreshments at Gelato Village last weekend and I think it’s fair to say we were both very happy to build a reciprocal business relationship. David is committed to loving and looking after our bees, including through education and social events and activities. I learnt a huge amount in just one hour of his, and his wife Hazel’s, company. This week’s Special Treat will be the first Planet Leicester Bakers bread to benefit from his nectar. 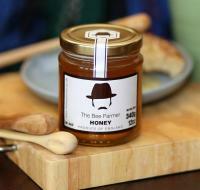 I’m also looking forward to stocking some jars of his honey for people to buy at events and with the bread on Bake Days. Not only does this tick a number of bread boxes for me – lovely, quality, natural ingredients in the bread – but also those of wider business values. Such as supporting other local businesses and also organisations working with people having to navigate a rockier road than many. And seeking environmental benefits. Being so small and young (Planet Leicester Bakers that is), with pressures of time and cost bearing down, it is not always easy to meet these ethical ambitions, but that doesn’t mean ‘don’t try’. Even if it is no more than just considering all options and making informed choices with sound reasoning. If I fail partly because I pursued a more ethical path, be it supporting local people, considering the environment or choosing more fairly traded global products, I’ll go down with my head held a little higher than if I hadn’t, and a little smile lingering a little longer. I think many of my customers share some of these thoughts and appreciate them. I hope so and I hope we are, together, a small but nonetheless important part in the bigger movement to love our real food, local communities and local environment. And I hope you’ll enjoy the honey sweetened breads to come. Oh, and buy a jar or more of David’s lovely stuff once I take delivery!